Lye, leached from the ashes of a fire, is an extremely caustic chemical found in most soaps -- even organic soaps. It is toxic to inhale and is not the best choice for someone just starting out in the soap-making craft. For beginners, an organic melt-and-pour soap base offers the easiest way to dip your toes into organic soap making. Avoid soap bases that contain propylene glycol; even though it’s organic, it’s a volatile organic compound found in antifreeze, plastics and soaps, shampoos and even processed foods. Products that say organic on the label must contain at least 95 percent organic ingredients. If the label says “made with organic,” these products are only 70 percent organic. Cut up the melt-and-pour soap base into small 1-inch chunks and put them into the glass bowl. Microwave the soap base at 30-second intervals on high until it liquefies. You can also melt the soap base in the top of a double boiler on the stove if you prefer. Add four to six drops, no more than 10, of your favorite organic essential oil such as lemon, mint, rosemary or lavender. Stir the essential oil into the melted soap base thoroughly with a wooden spoon. Mix the desired color into the soap thoroughly by adding two to four drops or until the liquified soap achieves the desired color. Coat the square glass pan or the soap molds with coconut oil. Dip a paper towel into the solidified coconut oil and rub it directly onto the mold. Add the desired dried herbs or flowers into your melted soap base. If you are making lemon soap, grate the skin of the lemon -- called lemon zest -- to add it to the soap. Pour a bit of the soap base into the pan or molds before layering more flowers or herbs as desired. Allow the soap to cool and harden -- up to an hour or more -- before removing it from the molds. Tie with a ribbon or twine to give as a gift. Store in a cool, dry and dark location. Protect your hands by wearing rubber dishwashing gloves. A pound of melt-and-pour soap base makes about four 4-ounce bars. Add flowers to the bottom of the pan if you want them to appear at the top of the soap bars embedded in the soap. You can also substitute organic goat’s milk soap base or shea butter soap base for the melt-and-pour soap base if you prefer non-glycerin soaps. 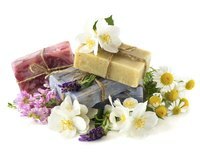 Do not use more than 1/4 ounce of essential oil for fragrance per pound of soap base. When heating the soap base in the microwave, do it in **30-second intervals** to avoid getting the soap too hot. It doesn’t take long to melt the soap base, but overheating it can lead to skin burns if it spills on you. Only use skin-safe or ingestible essential oils. Essentials oils dedicated to crafts and candles have not met the stringent safety standards required of ingredients for skin use.